At least 843 people have been injured too, officials said. 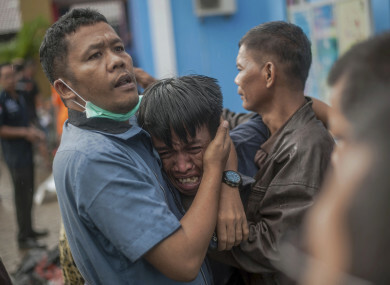 A man reacts are identifying the body of a family member in Carita, Indonesia. A VOLCANO-TRIGGERED tsunami has left at least 222 people dead and hundreds more injured after slamming without warning into beaches around Indonesia’s Sunda Strait, officials said today, voicing fears that the toll would rise further. Hundreds of buildings were destroyed by the wave, which hit the coast of southern Sumatra and the western tip of Java about 9.30 pm (2.30pm Irish time) yesterday following the eruption of a volcano known as the “child” of the legendary Krakatoa, national disaster agency spokesman Sutopo Purwo Nugroho said. BBC reports residents near the Anak Krakatau volcano have been warned to stay away from beaches as there are fears it could trigger another tsunami. The volcano continued to spew ash and smoke today. The Department of Foreign Affairs is closely monitoring the situation and is urging any Irish citizens in west Java to follow the advice of local authorities. If you have any concerns for Irish citizens who could be in the affected region, you can contact the department on 01 408 2000. Dramatic video posted on social media showed a wall of water suddenly crashing into an open-air concert by pop group Seventeen — hurling band members off the stage and then flooding into the audience. “We evacuated the victims who died and were injured, we took them to health clinics … Most of them suffered from broken bones,” he said, adding he feared more were missing. The volcano erupted again just after 9:00 pm last night, the agency said. An eruption just before 4:00 pm yesterday lasted around 13 minutes and sent plumes of ash soaring hundreds of metres into the sky. Indonesia, one of the most disaster-prone nations on earth, straddles the so-called Pacific Ring of Fire, where tectonic plates collide and a large portion of the world’s volcanic eruptions and earthquakes occur. Email “Indonesia tsunami: Residents near volcano warned to stay away from beaches after 222 killed”. Feedback on “Indonesia tsunami: Residents near volcano warned to stay away from beaches after 222 killed”.